We love really good BBQ, and we found just that in our visit to Food for the Southern Soul in the historic Charleston City Market. Before we get into our thoughts on the visit, let me tell you how to get there because you’re going to want to go, and if you look it up on a map, you will be lost. Food for the Southern Soul is a “‘Cue-osk” (kiosk), as they call it, inside the market building that is headed by the impressive Daughters of the Confederacy building facing Meeting Street. This particular section of the market is bounded by North and South Market, Church, and Meeting Streets. Most will enter the Church Street end, I suspect. See the photos below for reference. It is air-conditioned in that area, which is nice, but there is nowhere to sit and eat in that particular space. There are, however, tables and other places to sit just outside. Heather, Camden, and I headed downtown not knowing exactly where we would eat, but BBQ was the destination. We had three options we were choosing from: Queology, Cumberland Smokehouse, and Food for the Southern Soul. All of them are in the same area, around the market. Cumberland is relatively new. Queology has been around for a while, and, honestly, I thought that is where we were going at first, but after reading the reviews, I really wanted to try Food for the Southern Soul, which I will hereafter refer to as FSS. We parked in the garage on Cumberland Street, a good spot to park if you are visiting the market, and headed to find FSS. With some searching, we eventually found it and waited our turn in line. The menu is sparse. They do what they do and that’s that it seems, and that’s ok. The options pulled pork, beef brisket, or smoked beef sausage which you can get on a sandwich or by the pound (this option wasn’t available on our visit). With these you can just the sandwich, add chips and a drink, or 2 sides and a drink. The sides include mac & cheese, coleslaw, red rice, and banana pudding. We each ordered the pulled pork sandwich with 2 sides. Camden and I added coleslaw and mac & cheese. Heather got the red rice and banana pudding. We all got sweet tea, I believe. For the sandwiches, we had three sauce options: mustard, vinegar-pepper, or original (tomato-based). Heather got original, Camden got mustard, and I got the vinegar. We sat under an umbrella at one of the round picnic tables just outside on North Market to eat and enjoy. 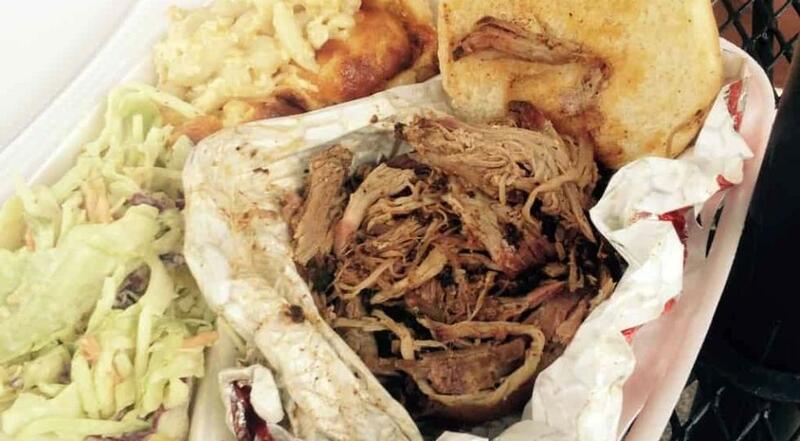 The sandwiches were piled with a very generous serving of pulled pork. My mouth watered just watching them make the sandwiches; it looked that good, but how did it taste? “How was the pork?” I asked later. “Pretty good” Camden responded right away. “Pretty good” from Camden is high praise. “Could you taste a smokey taste?” Heather asked. “It looked FANtastic as she was building the sandwiches, I have to tell you that,” I piped in. “You know it’s real pulled pork. It’s pulled; it’s not chopped,” Heather added. “It’s definitely pulled. There’s nice strands….” I agreed. As for the sauces, we got to try all three. “The mustard sauce had a mild spice,” he said. “It was pretty good.” He’s a man of many words. I had the vinegar sauce. “The vinegar sauce was actually the same vinegar sauce we bought and tried at home,” I noted. We have been trying to find a good store-bought vinegar-pepper sauce, and we recently bought Hagood’s BlackJack Barbecue Vinegar Sauce. “It’s kind of different actually. It is good vinegar pepper sauce,” I continued, “but not a great one. It lacked some of the spiciness you get with some of the Pee Dee area vinegar peppers… you know, with the red pepper flake and heavier cayenne.” Overall, it complemented the pulled pork well and made for a good sandwich. Heather had the “Original,” a more standard tomato-based sauce. As each of the sauces was served on the sandwich, we didn’t get to taste them separately. As for the sides, I have to say it didn’t take long for the mac & cheese to win us over. In short, get the mac & cheese. The coleslaw, on the other hand, got mixed results. “I saw celery seeds in it, and I tasted celery seeds with the pickles,” Heather added. “There were definitely pickles in it,” I agreed. “There were like sweet, cubed pickles but bigger than what you get out of the jar.” By this, I don’t mean “Sweet Cubes,” a Mount Olive brand pickle that you buy at the store, but more like almost a homemade sweet pickle that was cut up and added to the mix. Pretty sure I ate every bite of mine. And while the coleslaw drew mixed reactions, the opinion was clear on the red rice. “It was really a very good version,” I agreed, and there was nothing more to say. The pudding was similar to what we have seen a couple of places, most notable Sweatman’s in Holly Hill who made a very good version. The custard (or “pudding”) part of the dish is mixed together with whipped cream, which makes the custard lighter, but it can also diminish the flavor. “There wasn’t enough flavor in the banana pudding,” Heather contended, though it did have a sufficient number of bananas and real vanilla wafers. Bottom line is, of the three places we checked ahead of time and thought we might go to, I’m glad we picked this one. We’re confident you will enjoy it as well. I have to say I was impressed. The BBQ looked amazing going on the sandwich. I will order it without the bun next time. Thanks for the recommendation. I don’t generally order sandwiches when we do reviews anyway. Didn’t realize it was an option at FSS. Thanks. I go to FSS a good bit as I work in that area. It’s great BBQ for charleston. If you get the meats without the buns, you get much more meat for the same price. The brisket is pretty good too, with the red sauce.